The cumulative cost of natural disasters in 2017 was more than $300 billion. 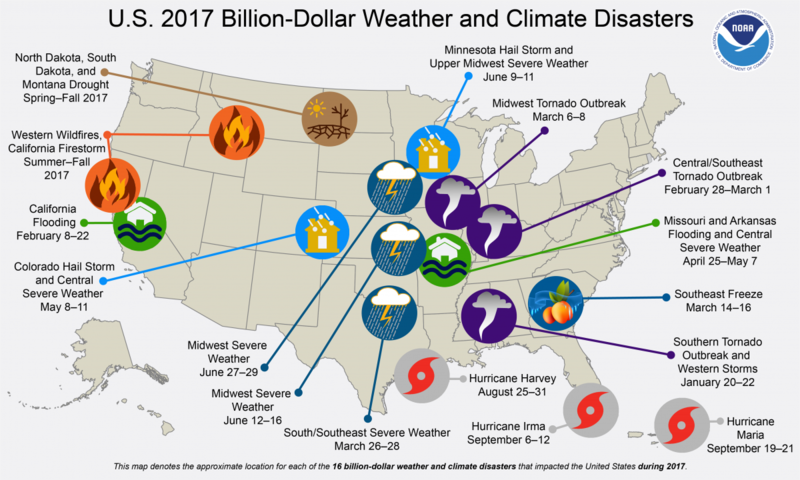 In 2017 there were 16 weather and climate disasters in the United States, which cost more than $1 billion each. This marks 2017 as the costliest year on record, according to the National Oceanic and Atmospheric Administration’s (NOAA) National Centers for Environmental Information (NCEI). The NECI evaluate climate events that have significant economic and societal influence both in the U.S. and abroad. According to the NECI, there have been 219 climate events between 1980 and 2017, and the cumulative cost of those events is more than $1.5 trillion. The average number of events per year during that time period is about six, but within just the last five years (2013 to 2017), that average nearly doubled. The cumulative cost of disasters in the U.S. was a staggering $306.2 billion in 2017, a new annual record. The previous record was $214.8 billion (Consumer Price Index-adjusted) in 2005, thanks to back-to-back Hurricanes Katrina, Dennis, Rita, and Wilma that battered the U.S. The increase in what NOAA has termed “billion-dollar disasters” is both notable and frightening, and it begs the question whether or not this trend of more disasters, and more expensive disasters, will continue. It is unlikely that this sharp spike of climate events — and their financial impact — is just a coincidence. According to NOAA, 2017 was the third-warmest year on record in the United States. In fact, five U.S. states had their warmest year ever in 2017. While NOAA did not explicitly state that the direct cause of these disasters was global warming, there is evidence that climate change exacerbates disasters like flooding and wildfires. New Scientist reported that unprecedented hurricanes in the Arabian Sea were more likely thanks to climate change. But local, state, and federal governments also need to solidify and fund emergency preparedness plans. From electrical generators to potable water and shelter, distributing much needed resources in a crisis is a task the requires extensive preparation. Furthermore, educating the public about evacuation routes and crisis management could save countless lives in the wake of a disaster. It is clear that our impact on the environment and the growing realities of climate change are affecting not only the planet, but also the humans who live on it. New Data Shows 2017 Has Been One of the Hottest, Wettest Years on Record in the U.S.